The publication of the O’Neill report last May has set in motion a process that will shape how we manage pigs’ health in the UK in future. In response to the report, which warned of 10 million deaths a year from antimicrobial resistance (AMR) unless action is taken in human and animal medicine, the Government asked the Responsible Use of Medicines in Agriculture (RUMA) alliance to lead the process of setting targets for the UK livestock sectors. It established a Targets Task Force (TTF) made up of representatives from across the sectors, with pigs represented by National Pig Association (NPA) chairman Richard Lister and Pig Veterinary Society (PVS) president Mark White. What are the new targets? The headline from the announcement at a special RUMA conference in London was that the pig sector is required to reduce overall antibiotic usage by 62.4% by the end of 2020 from a 2015 baseline level of 263.5mg/PCU (Population corrected units). The 2015 baseline figure was based on the average of two estimates, the eMB-Pigs figure of 278mg/PCU and the estimated sales figure for the year of 249mg/PCU. Future industry-wide antibiotic use will be monitored via eMB-Pigs, but it is yet to be decided how, and by whom, individual farm usage will be monitored. However, the report noted that the highest users ‘may have to bear a disproportionate share of the total planned reduction’. 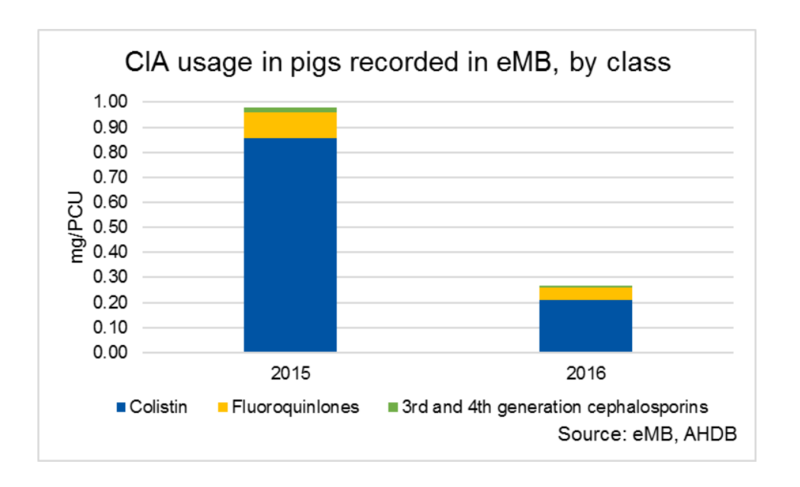 A big part of the story for pigs is the significant reduction in usage already recorded last year, as highlighted by the aggregated data collected from pig producers via the voluntary eMB-Pigs database, developed by AHDB. This data, extracted from the database in September, covered 61% of slaughter pigs in England for 2015 and 70% for 2016, based on Defra slaughter data. For the UK, the figures covered 56% of 2015 production and 62% for 2016. 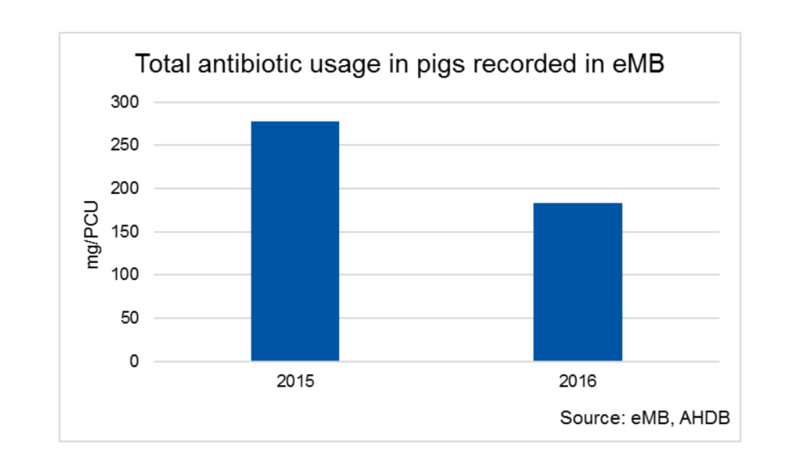 It showed that total recorded antibiotic usage in pigs fell by 34% to 183mg/PCU in 2016 from 278mg/PCU in 2015. These figures have been backed up by anecdotal reports from the marketplace, with large reductions, in particular, reported in sales of high volume in-feed products. They have also been reinforced by the publication by Defra of the 2016 UK Veterinary Antibiotic Resistance and Sales Surveillance (VARSS) report showing sales of antibiotics for use in all food-producing animals have dropped by 27%, from 62mg/kg in 2014 to 45mg/kg in 2016. Down from 56mg/kg last year, this is the lowest level since records began in 1993 and already surpasses a government target of 50mg/kg for 2018. Sales of antibiotics for pigs and poultry fell by 41% from 214 tonnes to 127t and sales of pigs-only antibiotics fell by 22t from 50t to 39t in 2016, the VARSS report showed. The eMB data showed that use of critically important antibiotics (CIAs), which are also important in human medicine – fluoroquinolones, third and fourth generation cephalosporins and colistin – also fell significantly in 2016. Use of CIAs fell by 73% to 0.3mg/PCU in 2016, representing just 0.1% of overall usage. Colistin usage fell by 75% from 0.9mg/PCU to 0.2mg/PCU (VARRS data showed an 83% drop in sales). Use of fluoroquinolones and third and fourth generation cephalosporins halved to 0.05mg/PCU and 0.01mg/PCU respectively. Recorded usage fell across nearly all antibiotic classes between 2015 and 2016, with the biggest category by use, tetracyclines, seeing a 20% drop. There is no proposed specific targeted reduction for CIAs. It is ‘anticipated’ that the existing ‘very low’ level of use will not rise above levels of 0.1mg/PCU for fluoroquinolones and 0.015mg/PCU for third and fourth generation cephalosporins – ‘subject to disease control requirements and to ensure health and welfare’. Only individual treatment preparations of these products have ever been available for pigs in the UK, but both remain vital tools for treating specific conditions, the TTF report said. It is understood that no colistin has been imported for commercial sale in the UK since mid-2016, with usage now believed to be negligible. But the report said colistin ‘should remain available in case of serious disease issues, for which its use is vital’. It suggests a ‘maximum use target of 0.1mg/PCU’, which may need to be reviewed depending on the availability of therapeutic zinc oxide. How will the targets be achieved? The report highlights how some producers have made reduced antibiotics by a combination of attitudinal change, improved vaccination, disease elimination strategies, better biosecurity, husbandry changes, investment in infrastructure and moving away from in-feed medication. It said the need for ‘targeted prophylaxis’, preventative medication in the short to medium term in response to specific disease challenges, will remain to protect the health and welfare of pigs – particularly where no vaccines are available or producers faced persistent problems ‘that prove intractable to non-antibiotic interventions’. But habitual or routine prophylaxis (a ‘just in case’ approach) ‘should be rapidly phased out’, the report suggested. But metaphylaxis, the treatment of whole groups of pigs once disease has occurred in some of that cohort, will remain ‘a fundamental requirement to ensure health and welfare in pig populations’, the report added. Addressing one of the pig industry’s biggest concerns, it stressed that monitoring of health and welfare will be essential and, if problems arise, the targets will need to be reviewed and, possibly, amended. Anecdotal evidence from other countries, such as the Netherlands, suggests reductions of 70% or more made too quickly ‘can lead to unacceptable health and welfare compromise in individual farms and this must be avoided’. The impact of Brexit, including potentially reduced UK medicinal product availability, including vaccines. Further reductions beyond 2020 will be considered ‘closer to that time, dependent upon progress made, health and welfare of the national herd, developing technologies and economic considerations’. Habit and fear of consequences of withdrawal.